At Sugar on Front Street in Wilmington, Samantha Smith provides and ever-changing selection of old-fashioned baked goods. The neon sign in the window glows with the words “OLD BOOKS.” Step into the 30-year-old bookstore, past the first sections of hard covers and paperbacks, just across from wall-spanning bookshelves that include the likes of a 1946 biography on Balzac, and you’ll find Sugar on Front Street. Opened in 2010, the bakery is where readers gather at a few small tables and six mismatched stools along a counter to sip locally roasted coffee and taste whatever Samantha Smith is baking — scones, heirloom apple crumb cake, sour cherry pie, lemon zinger cake. The ever-changing offerings of old-fashioned baked goods are “very rustic and not glamorous looking,” Smith says. She’s modest. 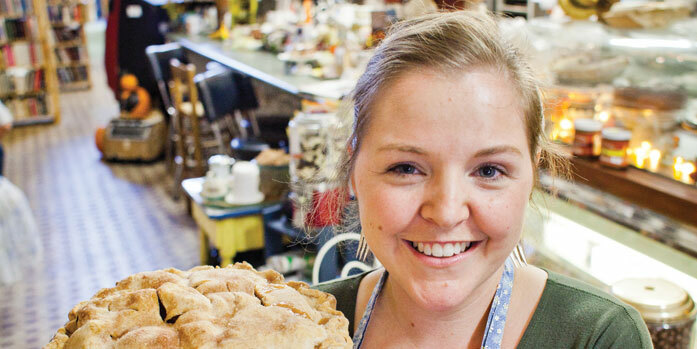 Her background as a professional pastry chef led her to open this place of her own. Everything is mismatched and vintage at Sugar, on purpose. “I have a problem; I like clutter,” the young baker says. “Did you see my old Toledo scale?” The hulking antique near a display case looks heavy. Smith’s warmth and enthusiasm for baking is infectious. While she works in her ponytail and apron, customers gather to watch, and they sometimes bring recipes and old cookbooks to share. Books, coffee, cakes, and conversation — this last stop on the North Carolina dessert tour, like so many of the others, sure feels like home.